Verry helpfull I just start my collection of Russian Cameras. Great site! I've recently grown more and more interested in Soviet cameras and I had fun reading your posts. Keep up the good job! People like you and your friends around the world make the internet a great place, thank you. Super Site ! My reference point for my ever expanding collection of Soviet cameras. Keep up the good work ! Hello! Firstly congratulation for your site! 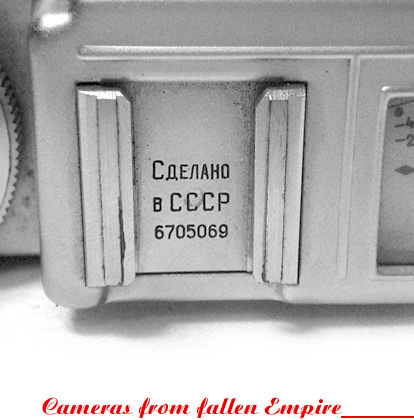 It's a realy big database about the Soviet cameras! I'm collecting the old cams (I have only 25 camera in my collection). I wanna repair my Cmena 8 (3rd version - PK2680). In the shutterhouse 3 parts moving independently to the others and I can't found any draws in the internet. I need a correct service manual or exploded drawings. Can You help me? Thanks for very interesting reading! I am interested in Kiev Cameras and early lenses. Just read about Jupiter-9 in LTM mount when I have some early ones. Some with 1.8 meter minimum focus distance. One of the lenses I have is from 1952, with closed fours, but as I said with the 1.8 meter minimum focus distance. Content is a Zeiss lens package, with serial number 2839783. According to Fabrication Buck Photo Optics, Carl Zeiss Jena (Hartmut Thiele) as part of this Sonnar in a group of 1000 finished 1945. But it is interesting enough to find Zeiss in a Jupiter-9 from 1952 with a Focusing Distance of 1.8 meters! A neverending source of information and reading. Well organized,good looking website with great photos. Congrats for the hard work. It would be awesome a pay-pal contribute/thankyou button!? We could say thank you contributing with some bucks to the effort. Hello my name is Manuel. And I come from Germany. Like your cameras very much. Thanks very much for your effort. I am now more knowledge on my just bought Lubitel 2. Very good to know the various version of the Lubitel 2. Well done.